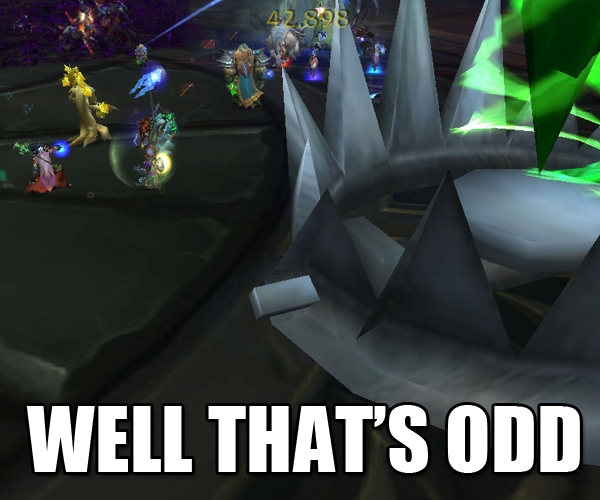 raid finder | That Was an Accident! 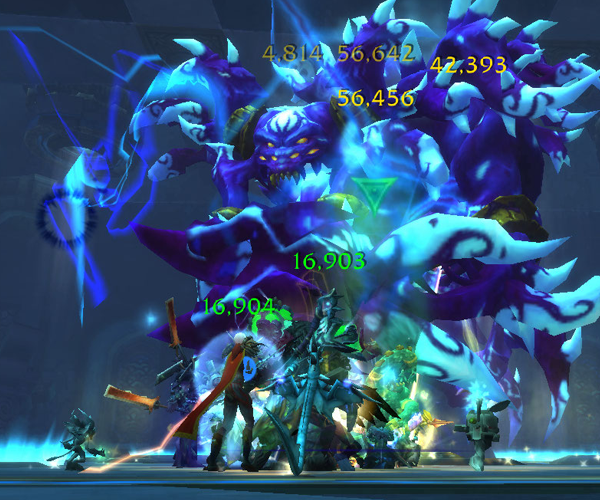 And of a different raid, but whatever, it was win. 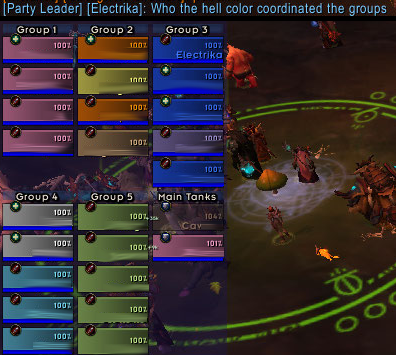 Thanks to the magic power of Battletags, Kash, Neri and I got a group together for LFR purposes. 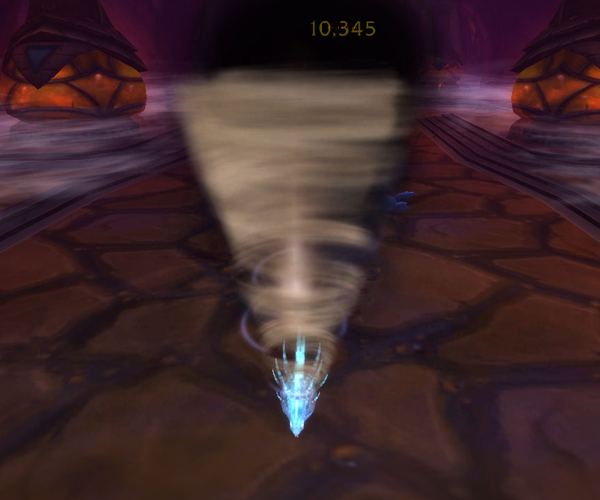 I selected Electrika for this occasion even though she’d already done her LFR rounds for the week because LIGHTNING HAHAHAHAHAHAHAHA LAVA WHEEEE I mean, uh, I’ve been having fun with elemental shaman-inating. 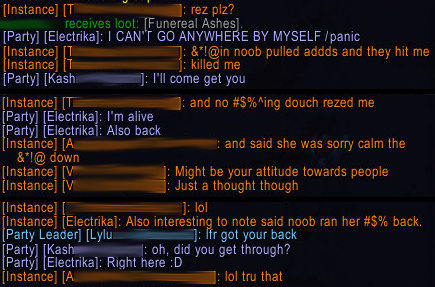 I queued as DPS to derp around since LAVA TO THE FACE it was rather late by my grandmotherly standards I’m scaaaaaaaaaared both Kash and Neri were healers, yeah, that’s it. 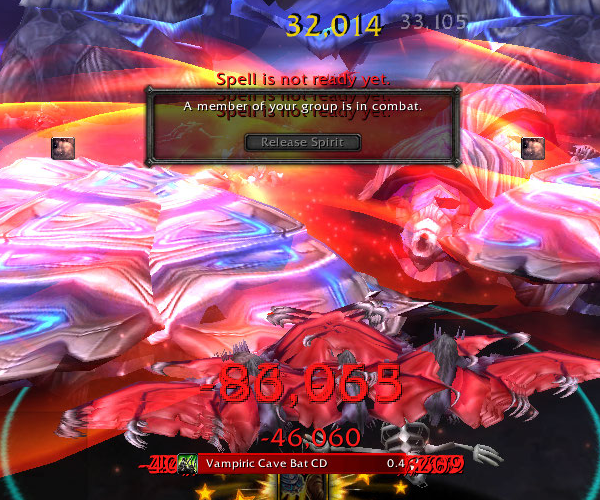 I perform somewhat unpredictably in elemental spec at this point. 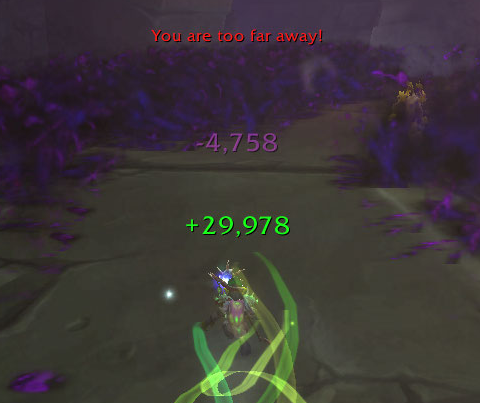 There are times when I surprise myself with my even-though-I’m-in-resto-gear DPS, and then there are times when I’m SO bad, I’m like #32 or lower on Recount. 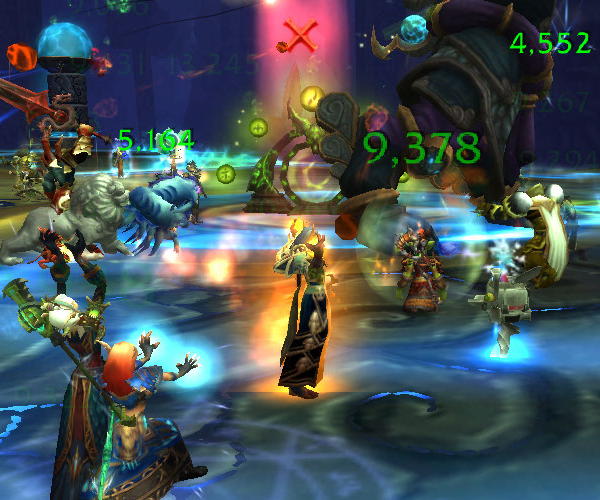 Yes, this number requires more than a handful of people to leave/join LFR, but trust me – it’s possible. 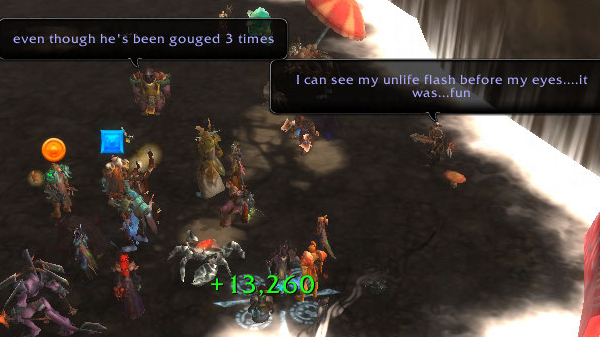 I invited Cal and we queued up, expecting the worst. 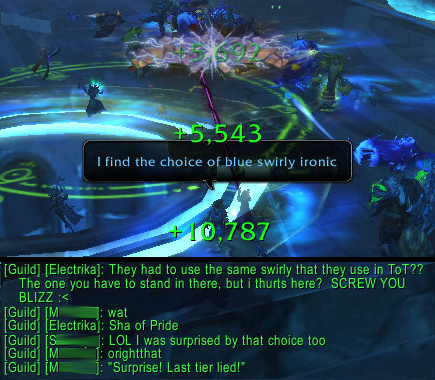 We were both shocked and pleased to make it past Tortos without a single wipe. 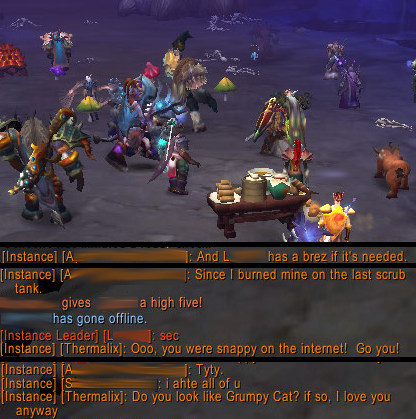 Indeed, we were thrilled to discover that we had landed in an LFR group that was, amazingly and wonderfully, NOT trying to win on the internet. 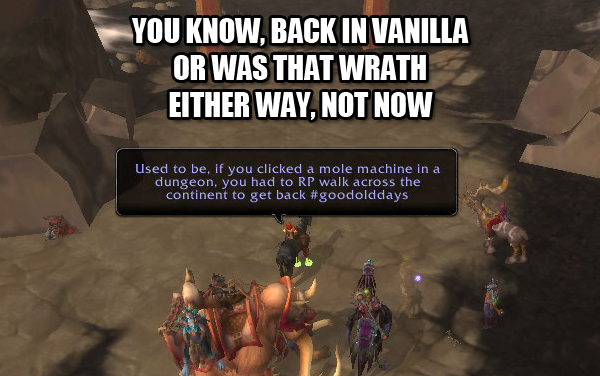 How did we know that we were part of such a group? Well, because I pulled trash. Oops. 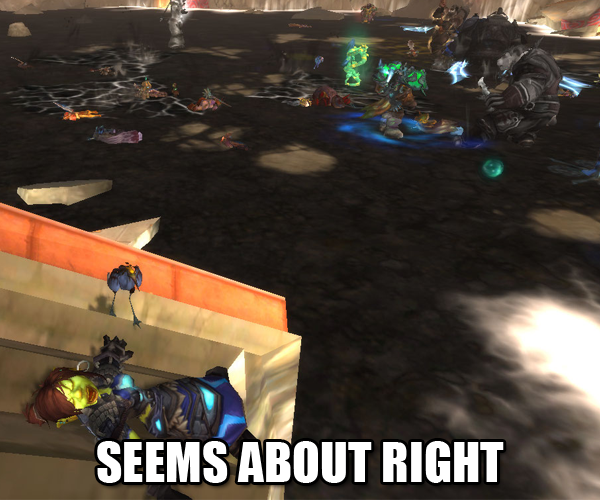 The expansiveness of the huge cavern in which Megara lives has always posed a problem for LFRs. Without being guided by hallways or something equally as obvious, people who don’t know quite where they’re going have a tendency to spread out a little too far for comfort. Folks also run face first into patrols or trash quite often. Because I’m generally too paranoid about pulling All The Things and will refuse to budge without a large number of bodies surrounding me, this is usually not my problem. (After all, it’s easier to spread the blame if there are more possible culprits.) This time around, however, lack of sleep shut down my typical “OMG WHAT IF” function, and I thought I could safely make it to that one area by the river without waiting for everybody else to move at the same exact time. I was, of course, wrong. I’m stunned, pleased and very confused. Well, hot damn. I’ve seen it all. They say hope springs eternal, and indeed, Kash decided that she was going to teach me how to live through Durumu’s maze phase. I’ve been getting a little better, to be honest, but I’ve not yet made it through on any attempt. We determined there several things were impeding my survival. One, I have projected textures turned off in order to improve performance, which may well improve performance but which is bad for surviving because it means you don’t see all the bad. Two, there’s a gigantic beam of death that was beaming me to death and which I wasn’t seeing, probably because goblins are short as hell. 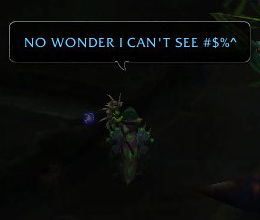 So, yes, purple bad, but laser exists too and is also bad. Also it’s dark down here, that may be a problem too. It was kinda like Alice in Wonderland following the White Rabbit, except instead of a rabbit, there was a tree. And instead of falling down the rabbit hole, you just fall down daeeeed. But really, it’s pretty similar. Follow the White … Treant? Not quite a rabbit, but it’ll have to do. Even under her tutelage, I failed. BUT THERE’S ALWAYS TOMORROW. 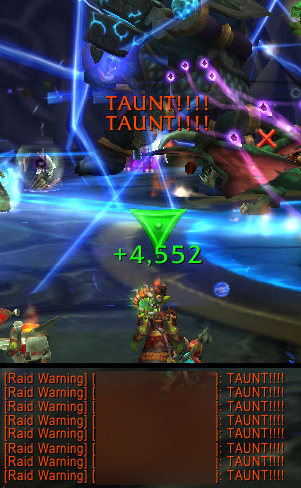 The LFR abruptly started to derp out around Dark Animus. 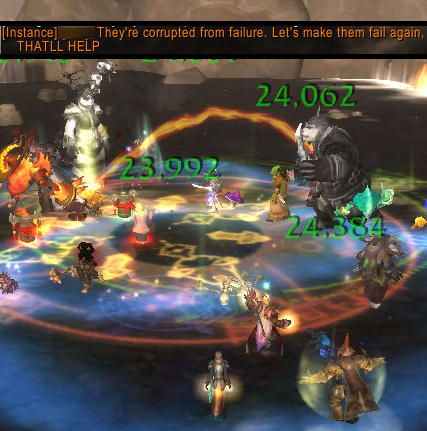 There were a couple guildmates from a server who recommended the AoE-all-the-things method, saying that the DPS was high enough for us to survive it. 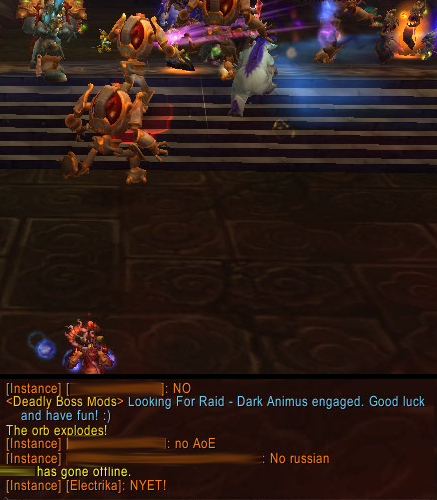 Well, guess not, since we wiped. 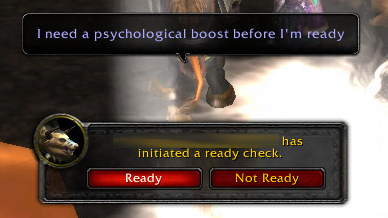 This seemed to trigger their inner smartass, which conflicted with the crankypants tank’s personality, and BAM! 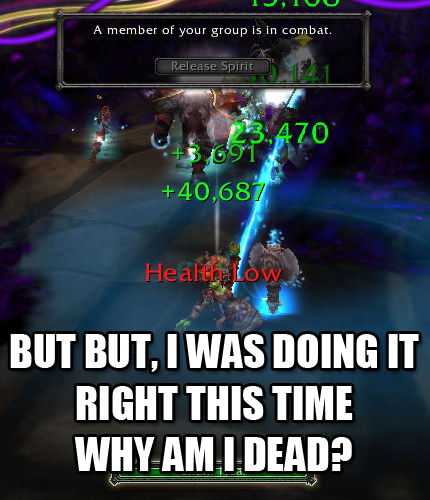 Spiral of bad started to happen. 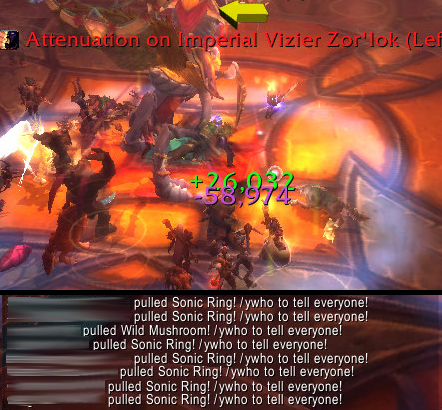 This wipe also made somebody develop a case of premature pullation, which proved to be awkward for everybody involved. The moment somebody triggered the encounter, the two party members with hair-trigger reflexes and connections (Cal and Kash) backed the boat up outside the door RIGHT before it closed. As a monk, Cal can roll backwards, of course, and as a druid, Kash did some sort of unnatural earth magic thing and, as they were then locked out, they were saved. 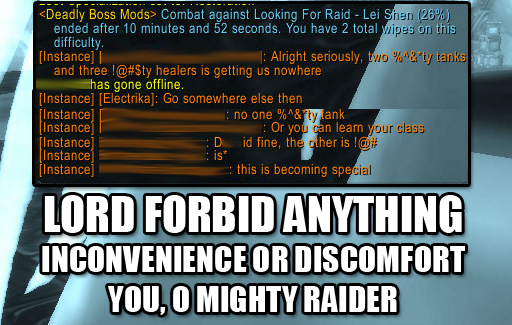 Those of us who were farther from the door and slower to respond wiped again. 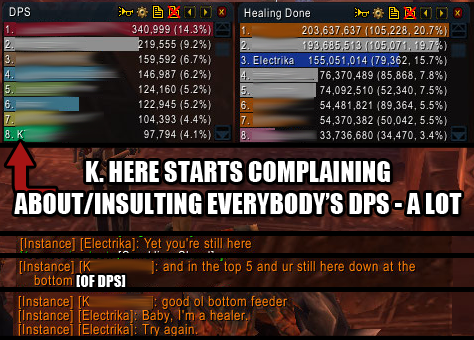 There was some votekicking of certain smartasses and some smartassing from those who thought kicking the highest DPS was probably bad (I think enduring smartassery is worse). 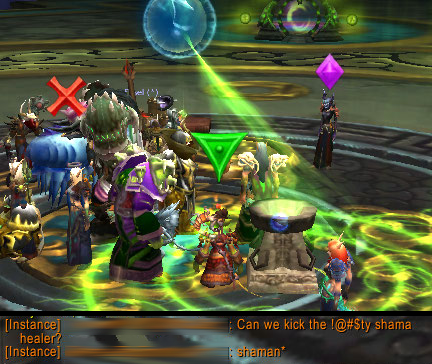 Then somebody prematurely pulled AGAIN, but the LFR apparently decided something to the effect of, “IT’S NOW OR NEVER AND WE WERE NOT GOING TO WIPE AGAIN DAMMIT.” Except for Cal, that is, who managed to Roll right back out the door the moment he saw somebody make an errant move while everybody else was rebuffing/eating/etc. We weren’t wiping, though, so he felt a little sheepish. Miraculously, he somehow got into the room for the fight. In the heat of the moment, nobody quite knew how he got in past the locked doors. 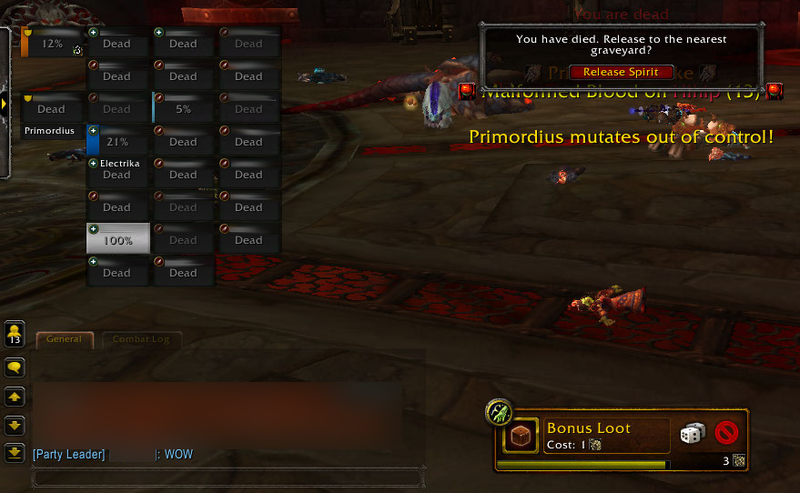 Then I died, so I took the opportunity to scroll up and look. It was Matter Swap. 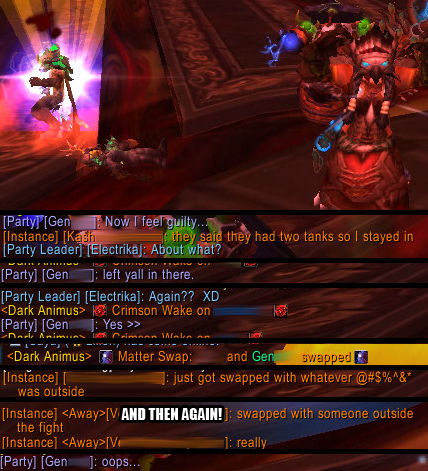 As it turns out, if you’re just outside the locked doors, you’re still a possible target for getting swapped with someone else in the raid! BRILLIANT. Think of all the potential applications! This could be both so good and so bad. p.s., Therm actually got a GUN gun from ToT and is weeping with joy over her improved firepower and also over finally passing the 500 ilevel barrier. She’s safely in at 505, leaving Ele in the dust (still) at 491. 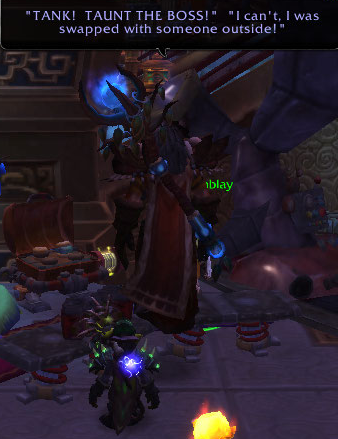 This entry was posted in Bombelina, For the Horde, Baby!, Goblins, OMGWTF, World of Warcraft and tagged /omg, bombelina (formerly electrika), goblins, lfr, raid finder, world of warcraft on July 8, 2013 by Prinnie Powah.